Clams, Oysters & Mussels are Now in Season! It’s bivalve season! Huh? you ask. Months that end in an ‘r’ are commonly believed to be the best months for oysters, mussels and clams. Cooler waters have less of an occurrence of algae blooms which can lead to high levels of toxicity in bivalves. These shellfish also spawn during warmers months and don’t taste as good when fertile. Beginning cooks tend to shy away from these guys—don’t, they are extremely easy to prepare. That said, certain steps must be taken to ensure optimal food safety and deliciousness. Here are some fabulous tips from The Tasting Table. Signs of Life: You never want to cook dead mollusks. They’re dead for a reason, and we can guarantee it ain’t good. Once they die, toxins build up in their tiny bodies, which they’ll pass to you, no matter how much you cook ’em. Inspect your catch right after you buy the bunch and again before you cook them and toss anything dead. If you’re throwing out more than a couple, be wary: “I’d worry about the toxicity of the overall batch,” says Lynne Rosetto Kasper, host of American Public Media’s The Splendid Table. How do you know if your bivalves are alive? Immediately get rid of anything with broken or damaged shells. Clams and mussels shells should be slightly open, and should shut quickly when you tap on them. If they’re closed, don’t shut or float in water, they’re dead. Introduce them to the trash. Oyster shells, on the other hand, should be closed tightly. And, as with all fish and shellfish, your bivalves should have a fresh, oceany smell with no hint of fishiness or ammonia. Room to Breathe: Your bivalves are definitely alive, right? Keep them that way by storing them properly. Never store them in plastic: They’ll suffocate. (That’s why most come in a mesh bag.) Instead, place them in a colander set over a shallow dish, cover with a damp towel, and store in the coldest part of your fridge. “If you really want to be a purist about it,” says Nick Branchina, director of marketing for Browne Trading Co. in Portland, Maine, “store them packed in seaweed,” which mimics their natural saltwater habitat. Yes, Scrub: Since most shellfish is commercially farmed, the product you’re getting should be pretty clean, says Kasper. However, you’ll want to give the outsides of the shells a good scrubbing to dislodge any remaining grit. Remove any beards by pinching and pulling. 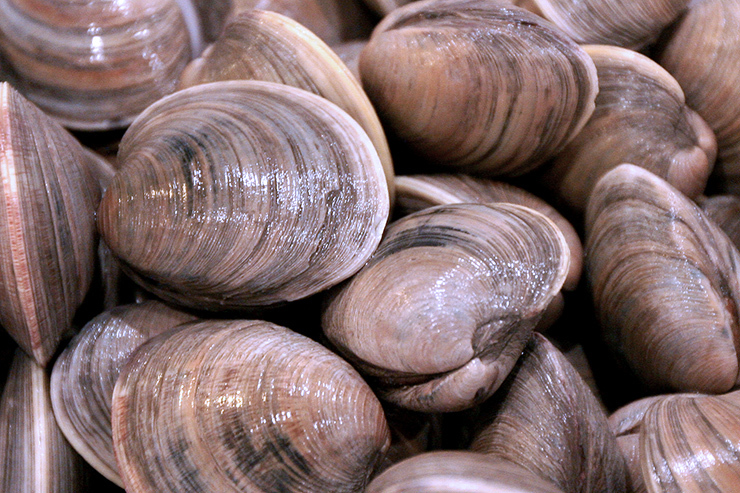 Fun cleaning-related fact: Clams with darker shells (which are the result of growing in silt or mudflats) are generally easier to clean, says, Steve Woodman, owner of Woodmans of Essex, a 100-year-old Massachusetts restaurant that specializes in fried clams. Lighter shells indicate that the clams grew in sand; they’ll be harder to clean. Get Rid of Grit: Most hard-shell clams will be fairly grit-free. However, says, Peterson, “steamers and razor clams benefit enormously from an overnight soak in salt water.” It has to do with their anatomy: Steamers (or soft-shell) and razor clams never close because of their siphon necks. “The sand isn’t just in their shells—they actually ingest it, too,” Branchina says. To get rid of this pervasive grit, you’ll have to purge them. 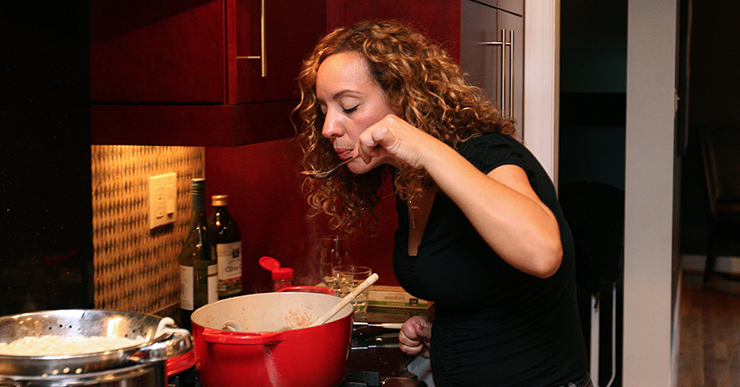 Most experts recommend soaking the clams in salted water (in the refrigerator!) from an hour to overnight. Simply add salt to fresh water: “Make it taste like sea water,” says Peterson. “You’ll find a bunch of sand at the bottom of the bucket the following morning.” Once rinsed, you’re ready to steam, shuck and enjoy. Clams, oysters and mussels are inexpensive and a great way to feed a crowd. You can pick up locally sourced bivalves from Whole Foods or you can get them from the family-owned and -operated Arnest Seafood. 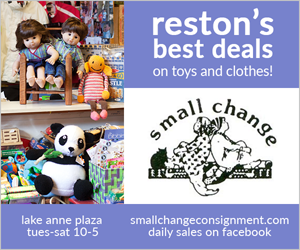 Arnest Seafood is one of the beloved vendors at the Reston Farmers Market. The day we visited with them they had a large supply of oysters and were shucking them for shoppers to taste. Their seafood is sourced by local fisherman in the Northern Neck of the Chesapeake Bay and also includes rockfish and crab. So now you know the basics and where to get these delicious shellfish, but what should you make with them? 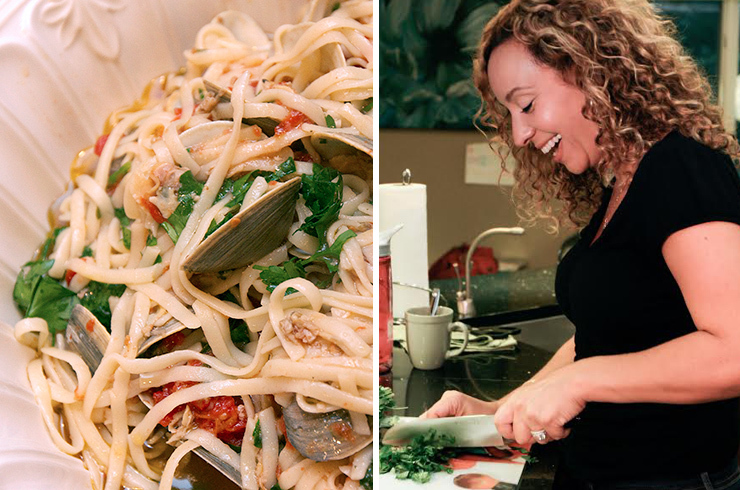 We asked Reston resident Alisa Ades to whip up her famous Linguine con le Vongole. Alisa is known around the neighborhood for this incredible dish. Bring an 8 qt pot of salted water to a boil over moderately high heat. Add linguine and cook to 1 minute short of al dente according to package directions (pasta should still be quite firm). Meanwhile, heat the olive oil in large sauté pan over medium-high until hot but not smoking. Add garlic and sauté until just golden, about 30 seconds. Add littleneck clams and 1 tablespoon red pepper flakes and sauté 1 minute. 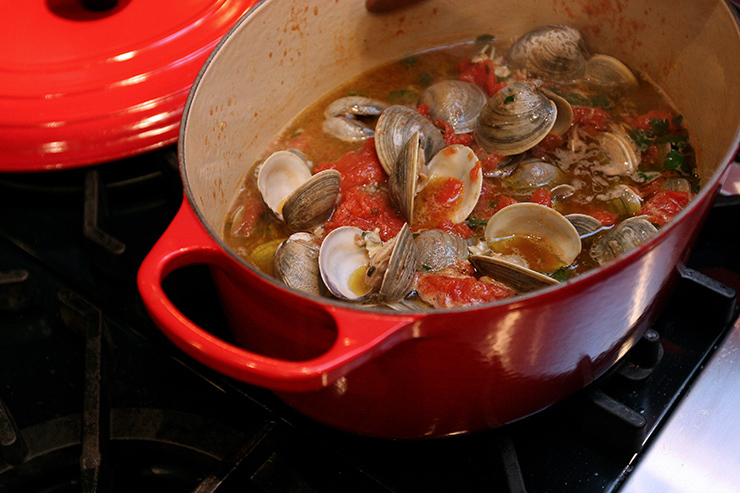 Add wine, tomatoes plus juice, the can of baby clams and 1/2 cup parsley. Simmer uncovered just until littlenecks open, about 7 to 8 minutes. 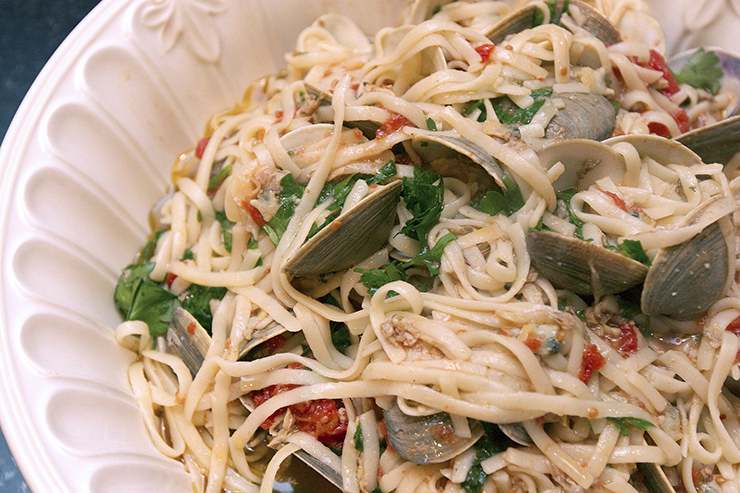 Drain pasta and add to clams reserving 1/2 cup cooking water. Simmer for about 1 minute tossing occasionally, until pasta is just tender. If the pasta looks dry, add some of the reserved cooking water. Remove from heat. Add remaining 2 tablespoons parsley, 1 teaspoon red pepper flakes and a glug of extra-virgin olive oil. Transfer to serving dish and serve immediately. 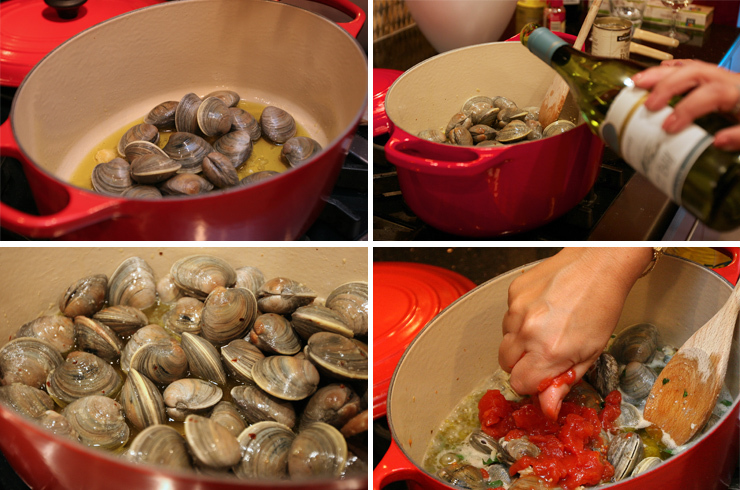 What are your favorite ways to prepare clams, oysters and mussels?